Looking for mechanic invoice templates? We've got you covered! Do I need more than just a mechanic invoice template? Mechanics are all about helping things to run smoothly, so why should your payment for that work ever stall? Using a mechanic invoice template can help streamline your billing process, which means that you are much more likely to get paid faster for your wok. With ZipBooks' free mechanic invoice template, you can even set up customizable late payment reminders just in case your customers forget to pay you within a certain amount of days. What should I include on my mechanic invoice template? One awesome benefit of ZipBooks is that you can save default settings for your invoices (like company logo and header and footer color) once you nail down what exactly should be on your invoice. Using ZipBooks for your mechanic invoice means never sending off an invoice without your own company information on it (oops!). 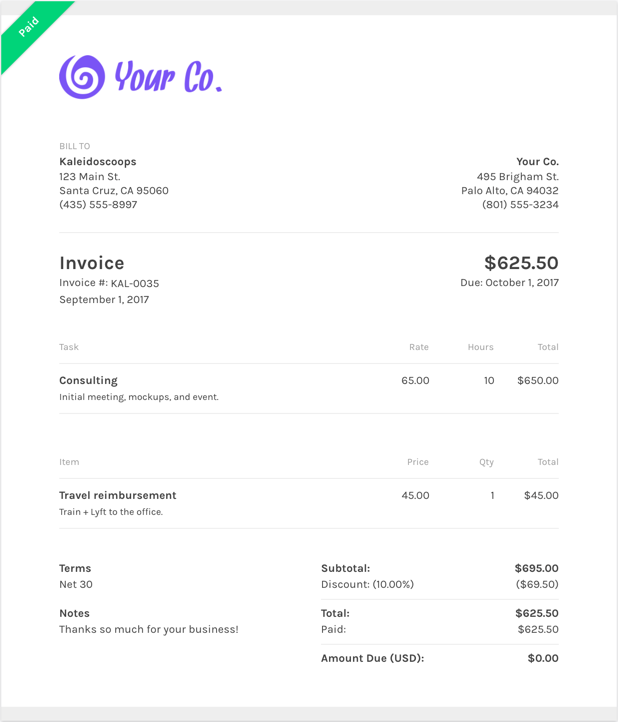 We actually collected data from tens of thousands of invoices and score your invoice based on what information you include so you’ll get you paid faster. Why should I use ZipBooks’ mechanic invoice template to create and send my mechanic invoice?